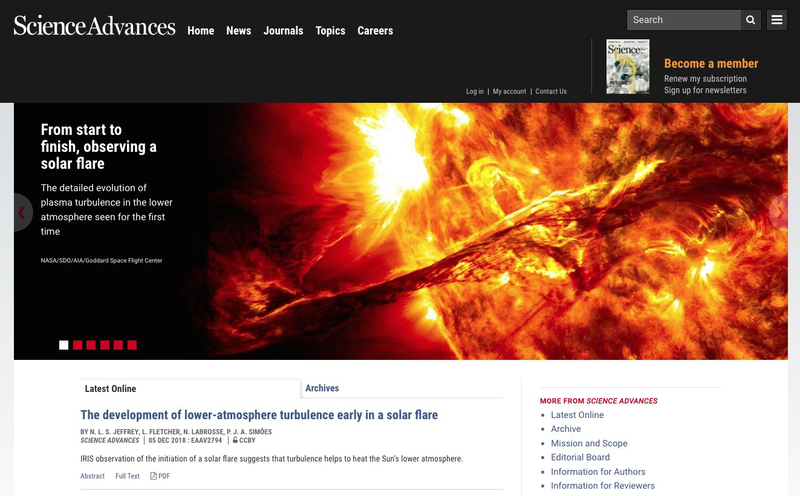 In the Science Advances article, “The development of lower-atmosphere turbulence early in a solar flare” the first observational study of the onset and evolution of solar flare turbulence in the lower solar atmosphere on an unprecedented time scale of 1.7s using the Interface Region Imaging Spectrograph is presented. The work, performed by A&A group members Natasha Jeffrey, Lyndsay Fletcher, Nicolas Labrosse and Paulo Simões, was published in Science Advances on the 5th December 2018. The flare (image below) occurred on the 6th December 2016. The flare observations are consistent with turbulence in the lower solar atmosphere at the flare onset, heating that region as it dissipates. This challenges the current view of energy release and transport in the standard solar flare model, suggesting that turbulence partly heats the lower atmosphere. Dr Galina Motorina (Researcher from Pulkovo Observatory, Russia) will be visiting us for three weeks. Her work is on the diagnostics of energy release in the solar corona using X-ray and EUV emissions (Support by the RSF grant No.16-12-10448). Xingyao Chen (National Astronomical Observatories Chinese Academy of Sciences, Beijing) will be visiting us as a PhD scholar for 12 months. 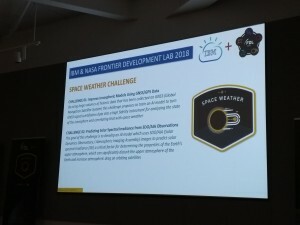 She will be work with the solar radio data from LOFAR and to study the energetic particles responsible for the solar radio emission in solar flares. 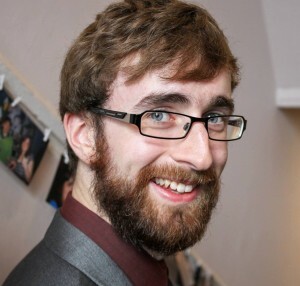 Ben Alcock with thesis entitled “Solar Electron and Radio Wave Propagation in the Turbulent Solar Corona” successfully passed his viva on Thursday March 22. A part part of the thesis was published and another part is in preparation for publication. A&A’s Dr. Ryan Milligan stars in his own TV show this week, all about two of his passions – astronomy and trucks. 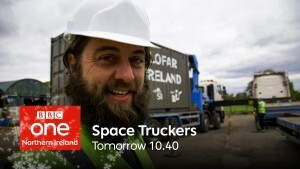 The programme follows Ryan driving a truck, hauling the supercomputer for the radio telescope i-LOFAR from the Netherlands to Birr in Ireland. It was broadcast on BBC Northern Ireland on Monday 4th December, and you can catchup with our very own EIS Road Trucker on iPlayer. The mini-volume published in RAA journal presented research papers based on talks at the 1st RadioSun workshop in China. The RadioSun network links research teams from China, Czech Republic, Poland, Russia and the UK. 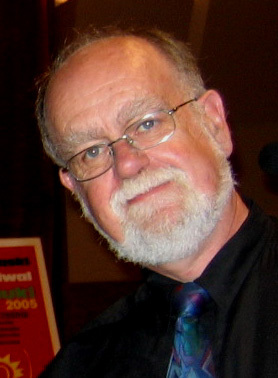 The paper by Hamish Reid and Heather Ratcliffe won a RAA Excellent Paper award. Galina Motorina was awarded a PhD degree for her work entitled “Dynamics of plasma heating and energy distributions of accelerated electrons during solar flares based on X-ray and ultraviolet emission“. 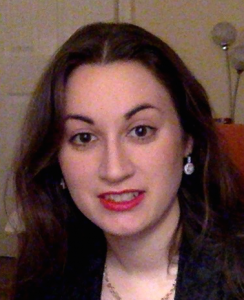 Galina was a visiting PhD student in Astronomy & Astrophysics group for a number of months and worked on thermal properties of solar flares and differential emission measure reconstruction from RHESSI and SDO observations. 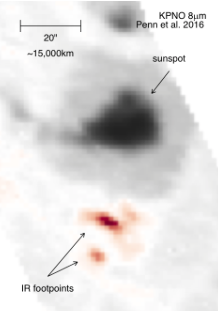 Right: Nicolina operates The Rawlings Array (UK LOFAR), Left: Observations of the solar radio bursts in sidelobes while pointing array to TauA. 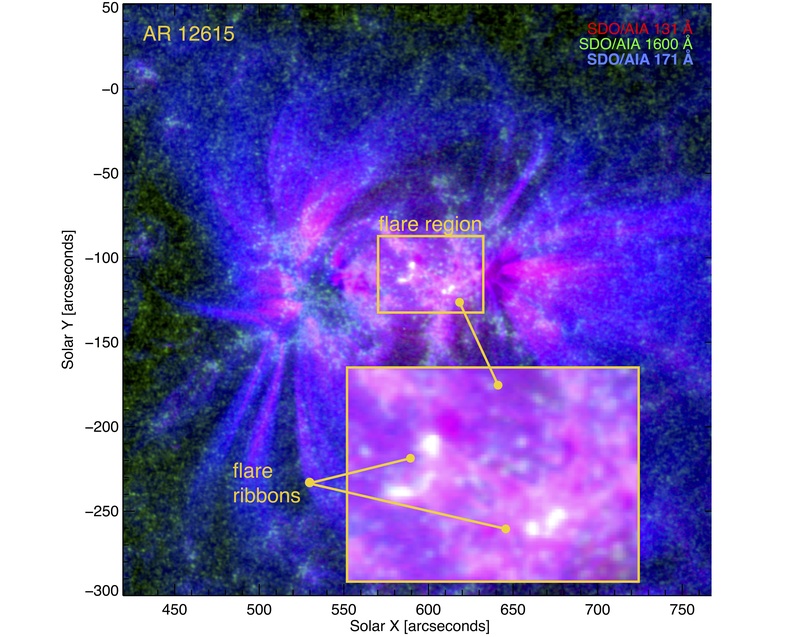 Nicolina Chrysaphi have successfully captured a number of solar radio bursts using the Rawling Array (aka UK-LOFAR). 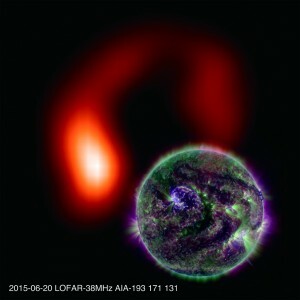 The preliminary quick-look images show the variety of fascinating solar phenomena. 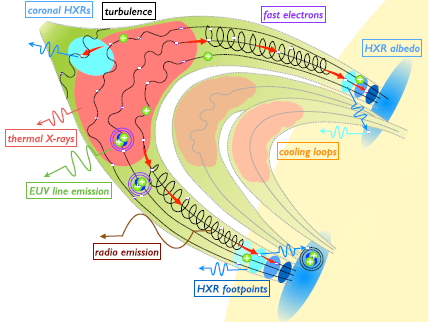 In the PhysicsCentral article, “Small-Scale Turbulence May Help Power Solar Explosions” the complex physics about role of turbulence in solar flares is explained using simple terms. 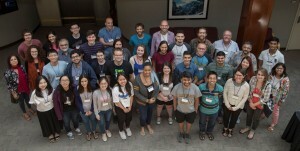 The Glasgow-led research team spread over 13 time zones represents six languages, five solar instruments, and various areas of expertise on the Sun’s activity. With PhysicsCentral, the American Physical Society communicates the excitement and importance of physics to everyone. First IR flare observed at 8 microns, showing two IR sources near a sunspot. 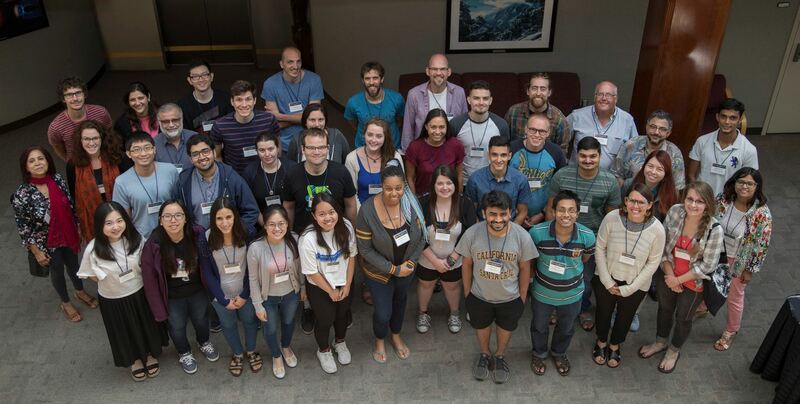 Research led by Dr. Paulo Simoes has been featured as a research highlight in a press release from the 15th European Solar Physics meeting, held recently in Hungary. Paulo’s work uses numerical simulations to predict the behaviour of chromospheric flare emission in the infrared continuum, and understand how it can be used to track the evolution of chromospheric ionisation. Armed with this new knowledge, new observations with the Daniel K. Inouye Solar Telescope will be proposed. We congratulate A&A’s Dr. Eduard Kontar. 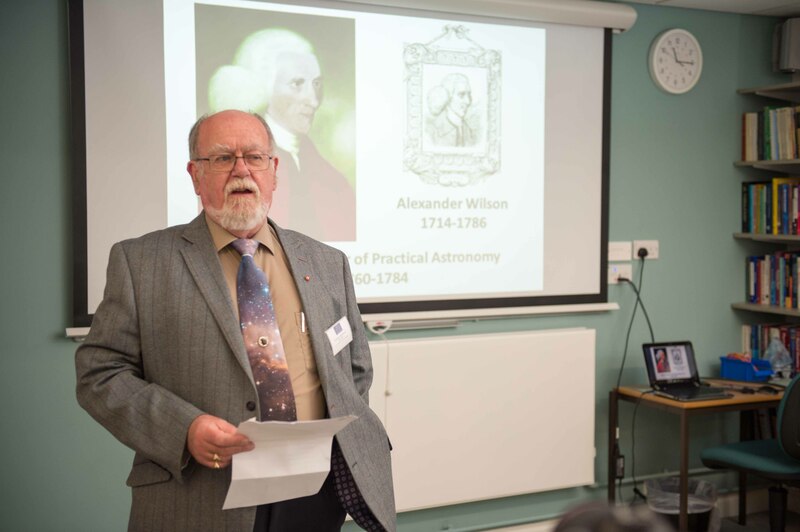 He was elected president of the European Solar Physics Division (ESPD) of the European Physical Society (EPS) during the elections at the European Solar Physics Meeting (ESPM) in Budapest last week. Dr. Eduard Kontar is also currently president of CESRA (Community of European Solar Radio Astronomers). Well done from the group! The ESPD is a division of the European Physical Society that represents and provides a forum for scientists interested in the physics of the Sun. 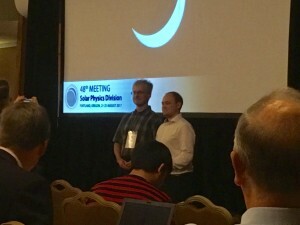 Paul Wright (right) receiving the 2017 AAS Solar Physics Division Student Poster Prize at the 48th AAS/SPD meeting in Portland, OR. We’re delighted that Paul Wright has been awarded the 2017 American Astronomical Society Solar Physics Division Student Poster Prize at the 48th AAS/SPD meeting in Portland, OR. 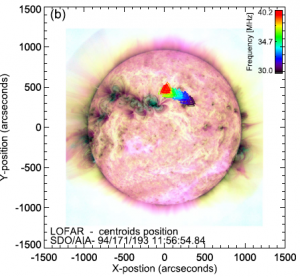 His poster was on “Microflare Heating of an Active Region Observed with NuSTAR, Hinode/XRT, and SDO/AIA”, and was based on a paper published in the Astrophysical Journal (including Glasgow co-authors Iain Hannah and Hugh Hudson). Paul (and Stephen Brown) received an SPD Studentship to attend the meeting. We’re delighted that the EPS Solar Physics Division chose to award its first-ever 2017 ESPD Early Career Prize to Dr. Natasha Jeffrey “for significant contributions to the physics of solar flares and for inspiring outreach activities”. The 2017 ESPD Prizes will be presented in the course of the 15th European Solar Physics Meeting, during an award ceremony specifically designed for this event. 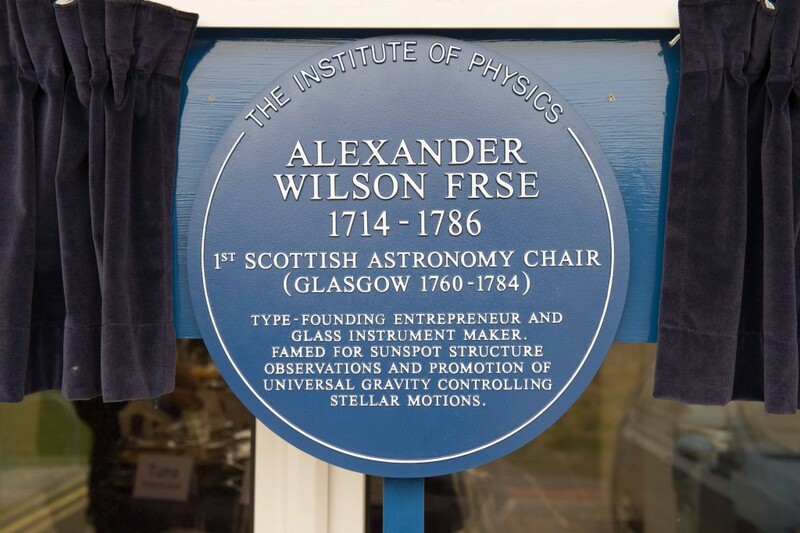 An Institute of Physics Blue Plaque was unveiled on Tuesday 28th March 2017 for Professor Alexander Wilson MD FRSE, the first Regius Chair of Astronomy at Glasgow (1760 -1784). 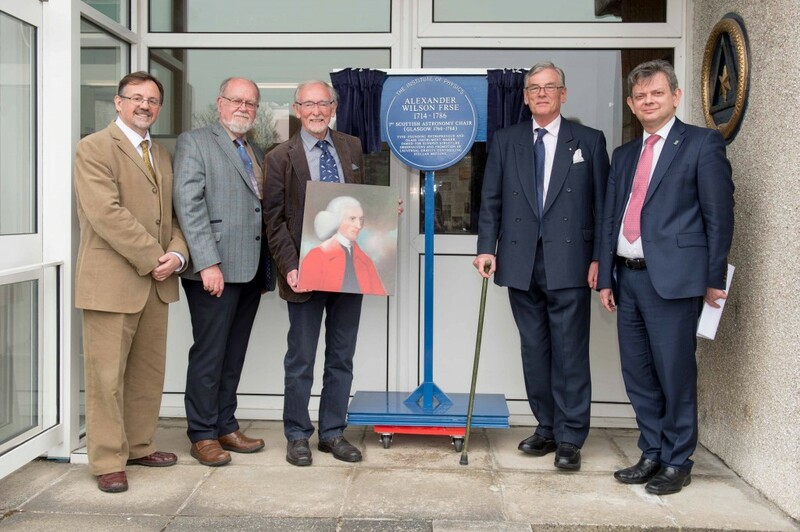 The ceremony was attended by the Astronomer for Scotland, Professor John C Brown OBE FRSE, University Principal and Vice-Chancellor, Professor Anton Muscatelli, former Reader and Director of University’s observatory, Dr. David Clarke FInstP as well as a descendant of Wilson, James Babington Smith. 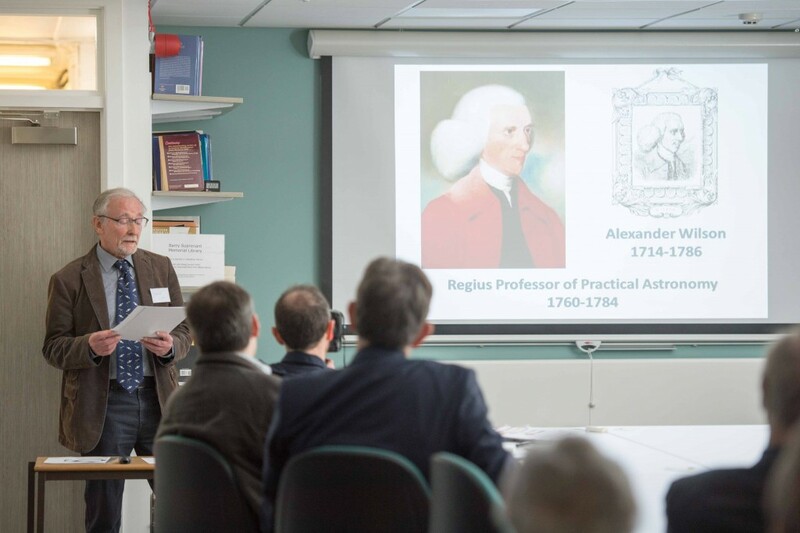 The event also saw presentations and display of material for the University’s Hunterian museum and National Museums of Scotland. 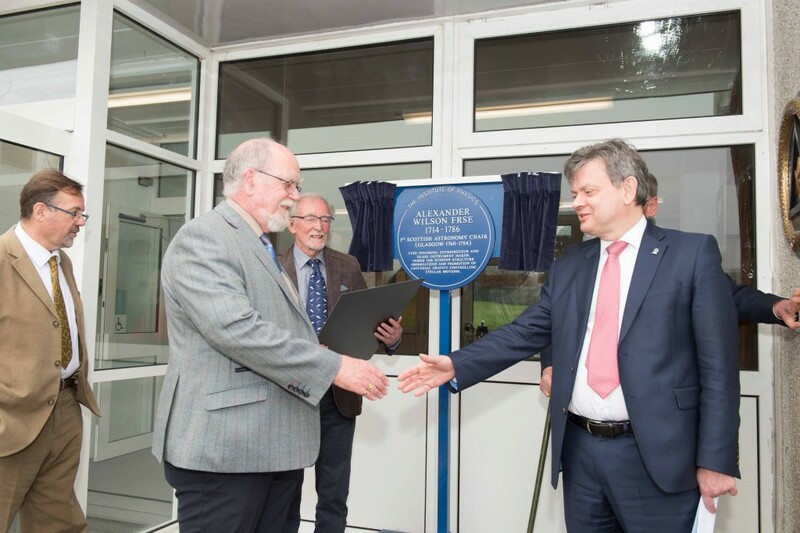 The blue plaque will be permanently mounted at the entrance of the University’s observatory at Acre Rd. 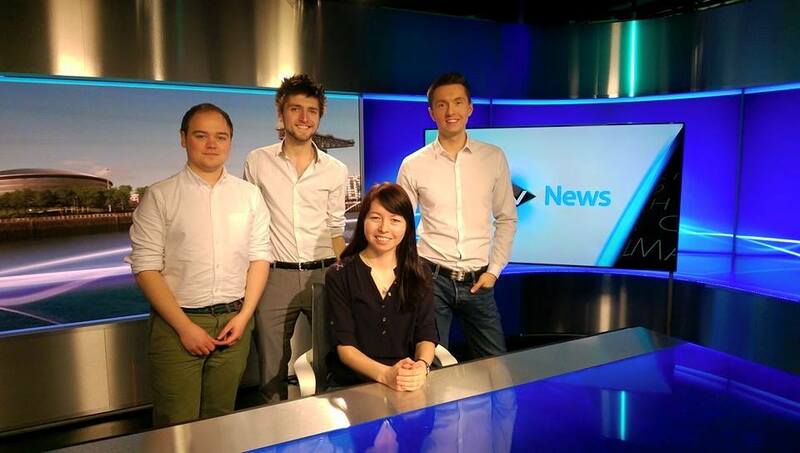 BBC News coverage of the unveiling. Congratulations to A&A group’s Professor Lyndsay Fletcher who has been elected a Fellow of the Royal Society of Edinburgh. Congratulations to Graham Kerr and Duncan Stackhouse! Graham Kerr with thesis “Observations and Modelling of the Chromosphere During Solar Flares” and Duncan Stackhouse with thesis “The Acceleration and Transport of Electron Populations in Solar Flares” successfully passed their vivas. Alliance Meeting on energetic particles in solar flares [webpage] , contact Nic Bian regarding the meeting. Glasgow now hosts the CESRA (Community of European Solar Radio Astronomers) website thanks to Kenzie Nimmo and Norman Gray. The recent solar radio (and other) science highlights can be followed, discussed and shared on Twitter and Facebook. Congratulations to the A&A group’s Professor John Brown (former Regius Professor of Astronomy and currently Astronomer Royal for Scotland) who has been awarded an OBE in the Queen’s Birthday Honours List “for services to the promotion of astronomy and science education”. A fully funded PhD studentship is available in the area of Solar Radio Physics at the University of Glasgow. It is a joint UK-Franco project supported by Direction Générale de l’Armement (DGA) and Defence Science and Technology Laboratory (Dstl). The successful candidate will be based in Glasgow in the Astronomy & Astrophysics group (http://www.astro.gla.ac.uk) and they will closely collaborate with Paris Observatory, Meudon. The PhD student will work with imaging and spectroscopic data from the Low Frequency Array (LOFAR), developing simulations to establish more detailed links between radio transient phenomena and the fine structures in radio burst spectra. The student should have a minimum of a 2.1 honours degree or higher in a relevant discipline and should be a UK or French National. The anticipated start date is 1st October 2016. Interested candidates should email Dr Kontar.